Home TopicsInvestment Strategies	What’s the Best Safe Haven During a Financial Crisis? Today is the 17th anniversary of the 9/11 terrorist attack on the World Trade Center in New York City and the Pentagon in Washington, D.C., by Islamic extremists. Wall Street was closed for a week after that fateful day in 2001. When it reopened, the stock market fell by 12% over the next five trading days. The markets continued to fall for another two years. The federal government went from a budget surplus to adding trillions to the national debt as the Pentagon expanded operations around the world to fight a never-ending battle against anti-American extremists. Which of the three provides the best protection? The safest defensive haven has been long-term U.S. Treasurys. 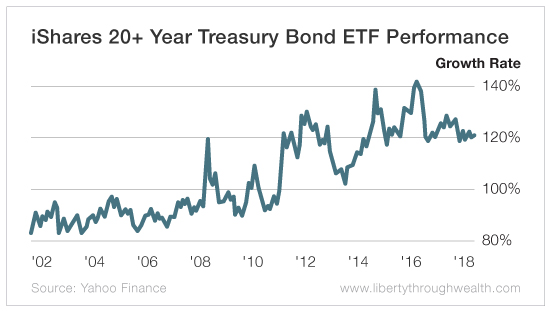 The iShares 20+ Year Treasury Bond ETF (Nasdaq: TLT) not only rallied after the 9/11 attacks but earned capital gains of 46% and produced a dividend yield between 2.6% and 3% for each of the past 17 years. You could have more than doubled your money if you had reinvested your dividends, while at the same time providing your investment portfolio with remarkable stability. Gold has provided a slightly better return overall, but at considerable risk and high volatility. U.S. stocks have turned out to be the best long-term investment, more than tripling in value since 2001, but you had to endure two declines of 50% or more (2001-2003 and 2007-2009). 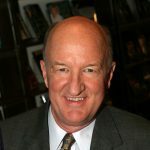 Since the financial crisis of 2008, the U.S. stock market has been the “mother of all bull markets,” outperforming gold, mining shares, Treasurys, corporate and junk bonds, and all major foreign stock markets. But what if there’s a major crisis coming? What if the permabears are finally right and the sky-high stock market crashes? Is now a good time to switch out of stocks and into U.S. Treasurys… or even gold? Gold is in a seven-year bear market and hibernating. A strong dollar and rising interest rates have hurt gold as an inflation hedge. However, if the Federal Reserve fears deflation and another recession, it will cut interest rates and that could fuel another upward movement in the yellow metal. Based on history, if there is another monetary crisis, there is no question that the best safe haven will continue to be U.S. Treasurys. Safe government bonds still play an important role in your portfolio if you want to hedge against a crash or crisis. Let’s hope another 9/11-style terrorist attack never happens. But if it does, there are still ways to protect your portfolio.